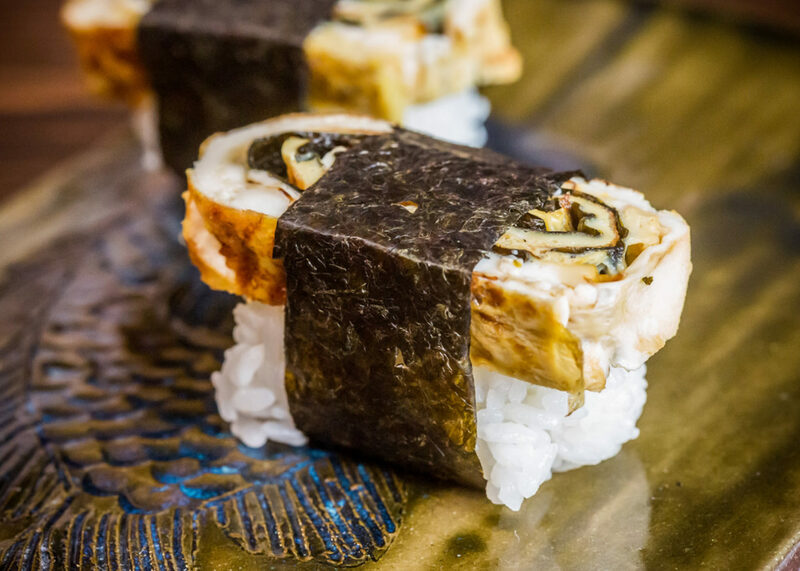 Tamago nigiri may not be the fanciest sushi out there, but it can be found at most sushi places. Cut the tamago into 1/2″ slices. Place the piece of tamago on top of the rice ball. You may place a small dab of wasabi on the underside of the tamago if you wish. Cut nori into 1 cm wide strips. Wrap 1 strip of nori around each piece of nigiri, cutting it to fit. Wrap it tightly enough that the nigiri won’t fall apart, but not so tight as to tear the tamago or cause the rice ball to come apart. Wow, breakfest sushi! 😉 Sounds very good. I may have to whip up a batch after turkey day for a little change from the ol’ meat and veggies. YUMMY!!! I used to love tamago. Now I’m more so so on it but it is still good! I’ll be cooking this up over the weekend as well. Sad to say my sumeshi wasnt good when made with Minute Rice. Looks like I’ll have to buy sushi rice. Andrew – Yay! Sounds like a good plan. Have a fun post-turkey day breakfast! Yvo – 🙂 Tamago is so yummy! Greg – I’m sorry to hear that your Minute Rice sumeshi didn’t turn out so well… hopefully you will have better luck with the sushi rice! This was my first sushi as a kid. Cause it’s sweet and non fishy. Still a favorite. Though I haven’t had tamago in a while … think I’ll go break into Umezono and eat a block of it. Andrew – I’m glad you liked it (although hopefully next time your sumeshi turns out better! 🙂 ) Good luck with the New Zealand Roll! Nick – I agree… I love tamago (even though I don’t make it correctly *blush*)! I always have to make sure I leave enough uneaten to make the sushi with! Just a thanks for your recipe! No problem! Hope it turned out well! Let me know! I’m really glad I found your site, and especially this recipe. In an attemt to eat a little healthier I have decided to start making myself bento lunches, and was trying to get my mom to try them to, but you can’t give her anything too scary. I think she’ll like this recipe, and I know I will. I found your website(s) a few weeks ago looking for a tamago recipe. This is beyond delicious. I’ve made it at least once a week since finding it, and my bf loves it too. Thanks! Emily – I’m so glad to hear that you and your bf both love it. I love to try to make these. but I can’t fund the Nori in an supermarkets. I just made some this evening and it is delicious! making the tamago is a bit of a pain and hard to get right sometimes I just buy the sweetend block of tamago from my local shop. Stu – That’s definitely a good possibility, for those who don’t want to make tamago at home and have access to a shop that sells it. can you make this without sugar? will it taste good savory. i just dont like my eggs sweet. I admit that I watched a coulpe of roll-making videos on You Tube after my first mostly failed attempt, and it made attempt #2 more successful. I don’t have a lot of experience with quinoa, but I wound think ti’s dry and doesn’t have the gooey texture that makes the sticky rice so successful. It would be work playing with more.